Things are a little different at the Apple Store in Hong Kong. While we might expect to see long lines at most of the other Apple Stores around the world and some jockeying for position as the new iPad is sold on a first-come, first-served basis, signs posted outside the Apple Store in Hong Kong specifically prohibit certain activities. In English, the signs say "No Staying or Queuing up here. 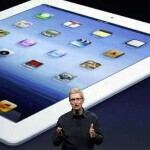 Apple will not serve on a first come first served basis for new iPad. Please refer to Apple's official website for the detailed arrangement". 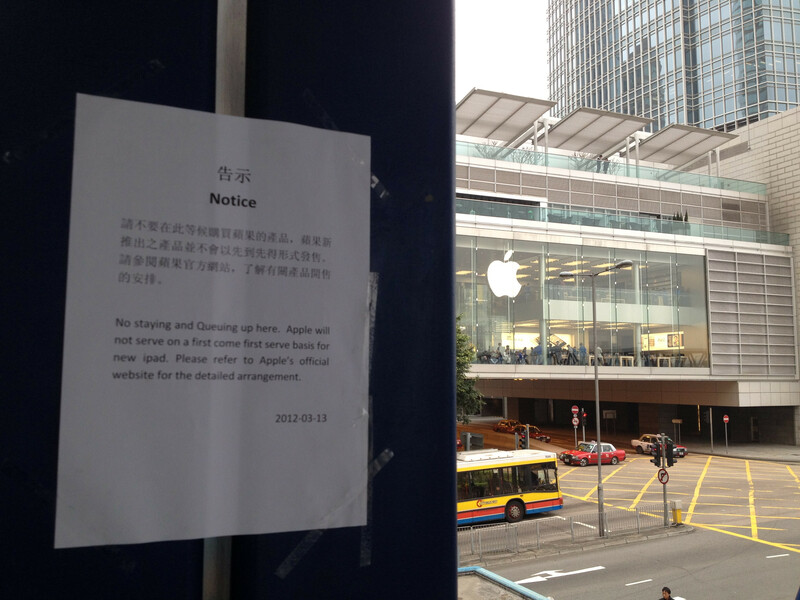 Without an Apple on the post, it seems that it is the Hong Kong Police who posted the signs. The new Apple iPad launches this Friday, March 16th at many locations around the world including Hong Kong. About 100 people have already lined up at the Hong Kong store, but not directly outside the location. The line, for some reason, was actually being formed across a footbridge several hundred yards from the store. The line means nothing anyway, because Apple is using the Reserve and Pick Up system in the country, that it employed with the launch of the Apple iPhone 4S. With this system, potential Apple iPad buyers enter their name, address and government ID number on Apple's website in a lottery. If they are among the lucky ones, they will receive an email telling them what time to come to the store to pick up their new tablet. The idea is to prevent scalpers coming from mainland China to buy Apple devices in Hong Kong, and then turn around and sell them on the mainland where these devices are hard to find. Apple has yet to announce a launch date for its new iPad in China which means that scalpers will be visiting Hong Kong and Macau for some time. The crowd lining up a few football fields from the Hong Kong store was asked to move by police, but ignored the request. Those lined up was described as "disheveled" by the local media and a far cry from looking like the scalpers who threw eggs and fought on the line at the Apple Store in Beijing during the Apple iPhone 4S launch in January. The violence forced Apple to stop selling its smartphone at its stores in China and the unit can be bought from Apple in the country, only from its online store. Meanwhile, as we told you on Wednesday, lines are starting to form outside the U.K. Apple Store in Regents Park.